Join the challenge and win €200 worth of Valsoia products! Take the leap and quit meat for one week! You can do it and we are here to help. We will send you recipes, information about participating shops, what’s on offer during the week, participating restaurants and so much more. Furthermore one lucky participant will win €200 worth of products from Valsoia. So give it a try, Seven days without meat is not difficult. Do it for your health, or for the environment, or for animal rights, or for world hunger or because of the abuse of antibiotics by the meat industry. Join the challenge by filling in the form here and tag us on social media with your progress using #maltameatfreeweek or on facebook during the week. We have a download section with many images you can use on your social media profiles for Facebook, Instagram and Twitter. Show others you have joined the challenge and at the same time promote and encourage others to follow. You can explain the reasons why they should join: health, environment, animal rights and world poverty. Share all the reasons as different people are motivated by different reasons. Let’s try to get more people to join the Malta Meat Free Week challenge. One week Zero meat. Use your social media media profiles to support the challenge. Malta Meat Free Week is on all the main social media platforms including Instagram, Facebook and Twitter. It is important that the message is positive and encourages others to follow. #maltameatfreemalta your photos on Instagram. 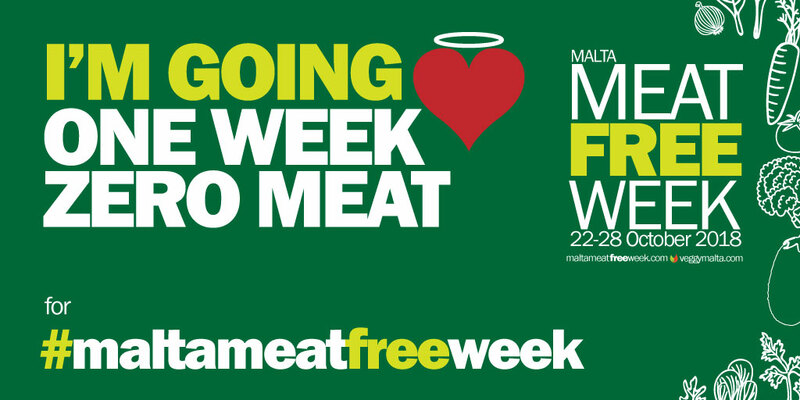 @MaltaMeatFreeWeek us on Twitter and Facebook. 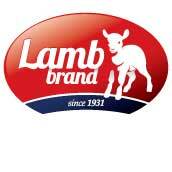 Furthermore we ask all to support our sponsors as they have made this possible. Without their financial help all of this would never have happened. We want to emphasise that we will not associate ourselves with any hate speech or actions. Whilst we encourage others to try our meat-free lifestyle and better understand the benefits we respect others who do not share our respect for life. 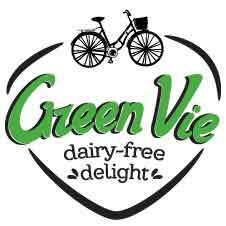 The promoter is VeggyMalta.com which is the organiser of Malta Meat Free Week. The competition is open to residents of the Republic of Malta aged 16 years or over except employees of any of the sponsors and their close relatives and anyone otherwise connected with the organisation or judging of the competition. Closing date for entry will be the 28th of October 2018. After this date the no further entries to the competition will be permitted. The rules of the competition and how to enter are as follows: Join the challenge via the subscribe/join button and share your experience via social media. 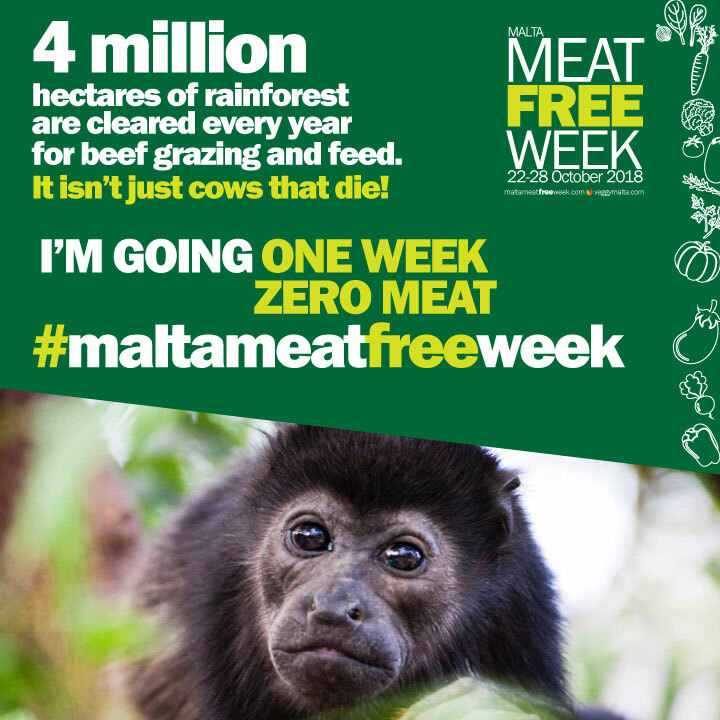 Sharing and linking to MaltaMeatFreeWeek social media will prove that you have taken part in the challenge. The winner also needs to be following wither our Instagram account or our Facebook account. The prize is as follows: €200 worth of Valsoia products. The prize is as stated and no cash or other alternatives will be offered.The prizes are not transferable. Prizes are subject to availability and we reserve the right to substitute any prize with another of equivalent value without giving notice. Winners will be chosen by random by software, from all entries received and verified by Promoter and or its agents. The winner agrees to the use of his/her name and image in any publicity material, as well as their entry. Any personal data relating to the winner or any other entrants will be used solely in accordance with current EU data protection legislation and will not be disclosed to a third party without the entrant’s prior consent. VeggyMalta shall have the right, at its sole discretion and at any time, to change or modify these terms and conditions, such change shall be effective immediately upon posting to this webpage. VeggyMalta also reserves the right to cancel the competition if circumstances arise outside of its control.